iRODS deployments are nearly always unique. Every organization has a different set of use cases, different existing infrastructure (instruments, storage, networking, compute), and different plans regarding maintenance and life cycle management for both their data and their processes. Our goal as a Consortium is to survey the landscape, understand the requests for different features and disparate use cases... but hear the similarities. We aim to see the common patterns and abstract the bits and pieces that can be reused and repurposed for the next deployment or the next industry. 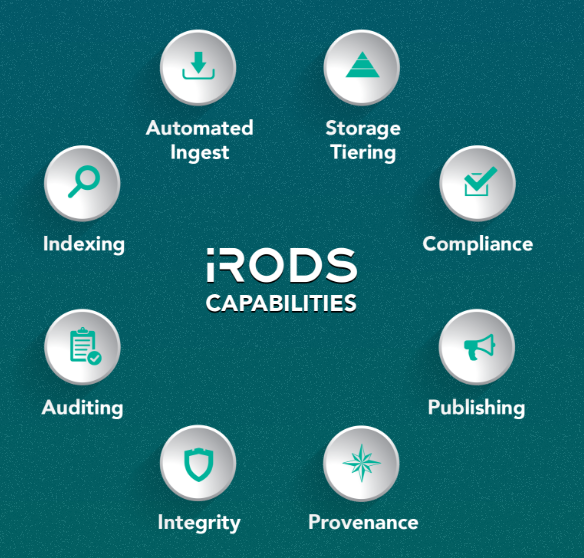 An iRODS Capability is defined as a packaged solution that requires only configuration to deploy. Organizations that come to the Consortium for help or advice need some subset of these eight capabilities to solve their data management issues. If you have others, please let us know. The first packaged capability we released earlier this year was the Storage Tiering Framework. Today, we are writing about the Automated Ingest Framework, which represents the second packaged capability, alongside some example policy. Two such patterns we have identified, and have now abstracted, involve the onboarding of new or updated data - and then its immediate synchronization into the main dataflow of an organization's data management infrastructure. We have seen one or both of these patterns from nearly every one of our new proofs-of-concept and potential members in the last year. The first is the "Landing Zone", whereby instruments (or other data sources) are placing data that needs to be ingested into iRODS and then the original is moved aside. The second is the "Filesystem Scanner" in which an organization's existing filesystem is to be maintained as the source of truth and updates are to be mirrored into iRODS. 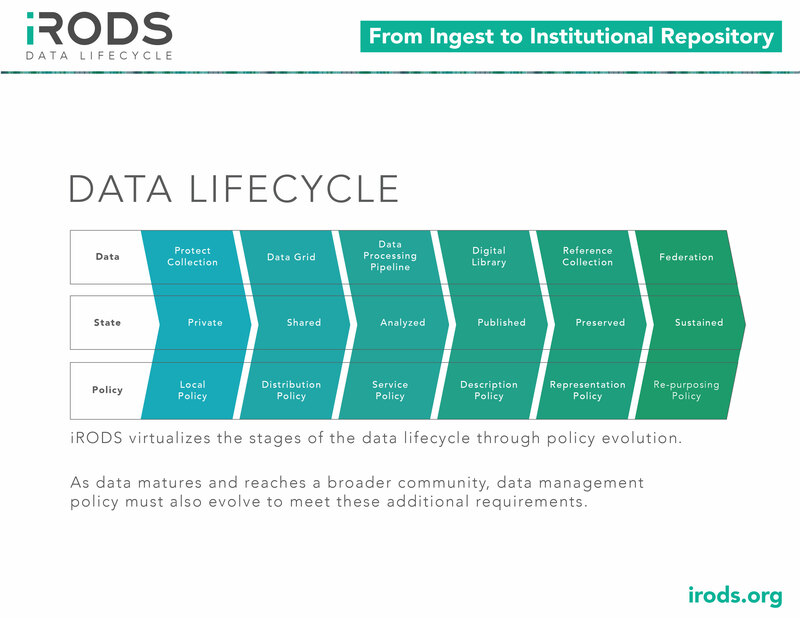 This second scenario occurs when an organization with existing data decides to deploy iRODS. This is the cold start problem. They need to register what they have so they can find it later. It also allows an organization with its own history and best practices to continue using those practices without changing their scientists' and other employees work habits or toolchains. Regardless of how the Automated Ingest Framework is configured, once new data hits the iRODS policy engine, events are triggered and action can be taken. That action is defined by policy, written and deployed as rules; in this case, in Python. We have written iRODS policy (a set of rules) to encapsulate this behavior and make it reusable for others. The code can be found here. The policy is written in Python and requires the use of the iRODS Python Rule Engine Plugin. The above set of example policy will afford an organization the ability to treat an existing filesystem as the source of truth, keep its existing toolchains and professional work habits in tact, but also can make the data discoverable, actionable, backed up, indexed, and available for automated processing by powerful workflows and any other custom policy you may write. Any work products derived from this data can be annotated with references back to the source data providing important provenance and audit trails required by regulatory agencies or publishing rules. Getting data ingested in an automated way is the first step towards taking control of your data and providing confidence to everyone who needs to use it.